I’ve been meaning to make a designated colour teaching box packed with rainbows for quite a while. This is one of my most exciting boxes and has been one of the most fun to put together. It is also very simple to make one yourself. I also found a set of rainbow eggcups at my local hardware shop and 4 saucepan-shaped plastic measuring cups from a charity shop. I then made a set of multicoloured wool felt balls and cupcakes. I put in a pot of matching glass pebbles too. It was such fun looking for rainbow coloured things to put in. Even my cat found the little felt balls irresistible! I will have to make a Feline Discovery Box. This Box is based around colour teaching, but also encompasses all kinds of sorting and imaginative play. Small children have found it hugely satisfying and absorbing to arrange all the little felt balls into different pots or bowls, whether matching or contrasting, and it really gets them thinking about which colours ‘sing’ together without needing to teach colour theory. After the first few play sessions I got into the swing of it and added rainbow felt flower shapes. I ordered a lot more felt balls and also a set of felt eggs and stars too! At only around 50p each, they are cheaper to buy than make myself. I also had some fun painting large wooden beads in rainbow colours. Because these materials are so simple and open-ended, there an infinite variety of possibilities within this box, from simple sensory joy of feeling the soft felt eggs to games of cake shop, restaurant, gardens and artistic arrangements; the children constantly surprise me with their creative ideas. 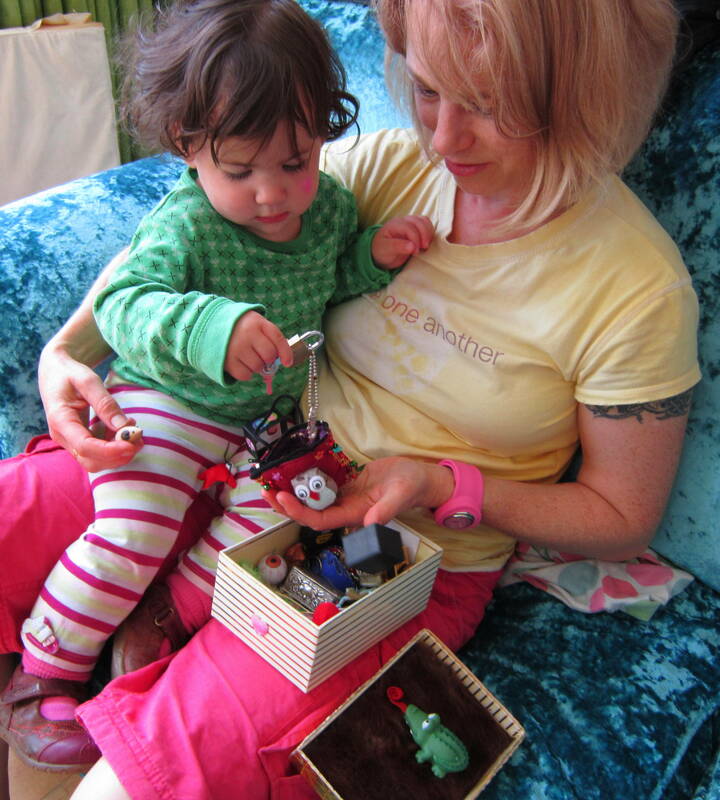 The magical simplicity of the Rainbow Box is truly a springboard for the imagination! In addition to sets of felt balls, shapes and cakes, I have sourced a few other beautiful rainbow toys which provoke wonder and delight in their small users. This Baby Beads toy is available on Amazon for around £10. It’s basically a giant bracelet of large colourful wooden beads strung together in a rather different way: the holes in each bead are at right angles to each other rather than opposite. This makes the toy malleable into different shapes and infinitely mouldable. To a small child it’s magical! The Rainbow Blocks I also got from Amazon for £20. Another juicy find was weeny little silicone pinch bowls, just right for child-size pretend play. I had to buy 2 sets in 2 colourways from 2 different manufacturers to get nearly all the rainbow colours (except purple and orange). One set is made by Norpro and the other by Zeal, both available on Amazon or eBay. They are around a fiver per set. A more economical option is a set of both large and small silicone cupcake cases (which I also bought); the mini silicone cases are exactly the right size for the 3″ felt balls! I have reviewed all of these on Amazon if you want further details. I got the little rainbow-rim egg cups from my local hardware shop for £1.20 each. They are great for open-ended play because the silicone rim detaches and becomes a little ring to place a ball or egg inside. They are made by Kitchen Craft Colourworks. My rainbow coloured melamine spoons (made by RICE) were from eBay. They supply beautiful Fair Trade 100% wool felt supplies and handmade items and have lovely friendly staff with great customer service. The balls are 50p each and the merino wool roving I used to make the cupcakes is easily available from this site or eBay. Have ready a bowl of warm soapy water and your lengths of wool roving (which is basically washed, carded, dyed sheeps wool rolled or folded loosely into hanks). I use merino wool as it’s softer. For a cupcake select a length of wool roving and tease apart the strands before pulling gently to release a section. Scrunch and roll the wool into a large loose ball in your hands; try to keep the strands spread/teased out rather than bunched up like a ball of knitting wool. Dip the woolly ball into the water, and holding it over the bowl, start to very gently mould and pat it in your hands to shape it. It will drip a lot. As your ball starts to come together, gently squeeze out some of the excess water and begin to very lightly and slowly roll it round and round between your palms to further form it into a ball. Keep your pressure gentle until the ball starts to fuse together. At this stage you can start to add more colours by winding loose lengths of roving around the middle or top of your ball, if you want it to look like a cupcake or simply make a design. The firmer your ball becomes, the more pressure you can use to roll it. Squeeze out more water, but it should stay damp. Keep rolling more firmly and faster. You can still add more details with wisps of wool if you like. If the ball looks ‘folded’, simply tease apart a wisp of wool, plaster it over the crease and keep rolling. Once your ball is the desired size and shape, and feels reasonably firm, rinse and squeeze the soap out of it under the tap before squeezing out as much water as you can and giving it a final rolling to perfect the shape. The colours should brighten up. You might like to sew or needle a little circle of felt on top before sewing on a bead for decoration. I resisted the impulse to sew on hundreds of tiny beads for sprinkles, as the felt feels so soft it would be a shame to make it feel scratchy or ‘bitty’, also I like simple toys as they encourage the child’s imagination to stretch out. Leave it to dry in a warm place (I used the radiator). Watch the delight on the face of your child!